The territory around Ventimiglia di Sicilia is beautiful and refreshing. The climate is mild and the history is long. Because of the extensive vegetation, animals and water sources, a nature reserve called the “Pizzo Cane, Pizzo Trigna, and Grotto Mazzamuto” Nature Reserve, was established in the year 2000 and it is comprised of the territories of the communities of Altavilla Milicia, Baucina, Caccamo, Casteldaccia, Trabia and Ventimiglia di Sicilia. Anyone today strolling along the ancient mule trails of this silent and extraordinary ambiance, which once was covered by a thriving forest, can admire the native species which flourish in the Reserve along with the diverse types of trees and floral displays which alternate in the Mediterranean undergrowth. Although the area of the Reserve (comprising about 11,500 acres) has never been the object of systematic excavations, the occasional discovery by scholars of numerous archaeological finds testify that on these mountains mankind has lived from the upper Paleolithic period in the Greek epoch to the Middle Ages. An investigation the terrace of Castellaccio conducted in 1997 and 1998 has disclosed a conspicuous number of finds including oil lamps, ceramic fragments, tile fragments with the upper striated sides decorated diagonally in typical Protobyzantine style, and some coins from the Roman epoch. The existence of early Middle Age inhabitation in the territory of Ventimiglia is also demonstrated in Castellaccio of a Byzantine seal with monogram dating to the late 7th century and some Byzantine coins. The dating of the coins (which covers an arch of time extending from the middle of the 7th century until the middle of the 12th), and the discovery of an Arabic inscribed bronze foil, confirm the inhabitation in Calamigna was occupied by the Arabs and lived in at least until the first half of the 13th century, when the wars of Frederick II of Svevia against the Muslim rebels led to the depopulation of many of Western Sicily’s rural areas. It was only some centuries later that the huge farming centers founded from the 16th to 18th centuries in the island’s interior by means of Royal licenses to populate began to rise in these extensive regions. The land, abandoned for centuries, was brought to cultivation. Thanks to the initiative of the feudal lords, the so called “latifondi” were repopulated. In the 17th century the Calamigna of the Middle Ages was revived thanks to a princess bearing the name of one of the most powerful Sicilian families: the Ventimiglias. Although the bond uniting the Ventimigliesi to the ancient agricultural region of Calamigna is strong, the birth of the town is credited to Beatrice Ventimiglia, the noblewoman who obtained the title of “Princess” from the Spanish king Phillip IV, and on September 11, 1627 a license to found a new center of inhabitation in the fief of Calamigna. Concessions were made to the inhabitants of nearby villages in order to populate the new town. These included land grant contracts known under Roman law as “enfiteusi” and land for construction of houses. The fief (which came to her as a dowry in 1617 after her marriage to Girolamo Del Carretto, Count of Racalmuto), survived with the descendants of the dynasty Ventimiglia-Del Carretto until 1778, when it passed to the Grifèo (Princes of Partanna) who held it until the abolition of feudalism in Sicily. The town is set in a fascinating natural ambience characterized by the presence of centuries-old olive trees. The healthy air, the fresh water springs, the temperate climate all contribute to make Ventimiglia an ideal destination for relaxing sojourns. It is about 40 KM southeast of Palermo at the foot of the mountain Pizzo Cascio and on the River Leonardo above sea level by 540 metres. There are around 2300 people living in Ventimiglia di Sicilia and the economy is basically agricultural. They grow olives, cereals, legumes, almonds, and the prickly pears are so wonderful that, in October, they even have a Feat of the Prickly Pear. They are also breeders of cattle and pigs. The first Sunday of October is the Feast day of their Patron Saint, Madonna del Rosario. On this day, they have musical shows, a livestock festival and, of course, the Procession. In the year 1863, the ‘Di Sicilia’ was added to give it distinction from the Comune di Ventimiglia that is in Liguria. Ventimiglia’s oldest artifact in existence is a 17th century watering trough that stems from the time of Princess Beatrice. It can be found on Avenida Garibaldi, adjacent to the Square. In this area there was once a beautiful castle that the Princess had erected by workmen from Cimmina. Because it was modified over the centuries, it is no longer the majestic palace that it once was. In this same area there is also a Monument to the Fallen, which was erected in 1932 thanks to a committee established in the United States. The Mother Church rises on the square dedicated to Monsignor Giuseppe Lo Cascio (who was born in Ventimiglia in 1870 and was its spiritual guide for 33 years and a founder of the Popular Party along with Don Luigi Sturzo). The church was built in 1628, scarcely a year after the founding of the town, and, according to the wishes of Beatrice Ventimiglia, it was to be dedicated to the Immaculate Conception. The bell tower, which was not present originally, was added later. The new City Hall was given a modern building on the high part of Via Umberto, in which all the communal offices are found. Among the infrastructures developed in recent years by the Communal Administration (realized as a part of the recreational and cultural renewal of Ventimiglia di Sicilia) are the swimming pool and the astronomical observatory inaugurated in 2001 and named for “Enzo Brancati”. At one time the liturgical and economic cycles were perfectly integrated in Ventimiglia di Sicilia. In fact, the religious festivals filled each month of the year, except July and November, the months when the grain and olives, principal products in the economy of Ventimiglia, were harvested. The simulacrum, or image of the Holy Crucifix, carried in the procession the third Sunday in May dates back to the time of Princess Beatrice Ventimiglia. The devotion for the Holy Crucifix is rooted in the town’s traditional agricultural vocation. The times are not long past when on the feast day, the peasants returned from the countryside bearing bunches of broad beans plants to ornament the vara. The so called “Ferragosto”, on August 15th, is the Feast of the Assumption and national holiday. The scene shifts to one of the hills surrounding Ventimiglia to the height on which the sanctuary dedicated to Our Lady of Grace was erected in the 17th century. Next is the Procession of Our Lady of the Rosary, venerated and honored since 1696 by the people of Ventimiglia as their primary Patron Saint and unique Protector. By ancient privilege the procession of the Patron Saint takes place the first Sunday in October. At one time the festival lasted for several days and was accompanied by horse races with and without jockeys. Today this religious event is made attractive by the composure of the brothers and the faithful who precede the simulacrum, and by the sea of people joined by the civil authorities in procession. 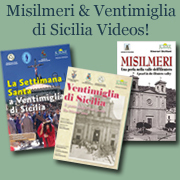 For more on the Easter Celebrations in Ventimiglia di Sicilia, check out the VHS Documentary: “The Holy Week in Ventimiglia di Sicilia”.